From time to time I hear from someone whose car disappeared, only to find out it was towed away. And now, there is a huge storage fee to be paid to recover the vehicle. Or worse: The car was auctioned to pay the fees. Is this legal? Hang on. It gets worse. The laws on this will vary from state to state but the processes are often similar. I will explain how it works in Michigan; you can find out the law in your state by Googling the phrase "[State] Towing Storage Lien," and inserting your state in the query. Also, there are a raft of parking violations which might lead to your car being snagged: if it is left obstructing traffic, in a tow-away zone, blocking a handicap ramp and so on. Most of these would be avoided if the car owner simply obeyed the nearby signage, but you know how that goes. Of course, some cities like Detroit are just rife with tow truck drivers who will grab anything, regardless of whether it is illegally parked or not. Once the vehicle is "taken into custody," the owner and any lienholders are supposed to be notified of that fact and the status and location of the vehicle. You only have 20 days from the date you get your notice to claim your vehicle. If this happens in Detroit, good luck with that. The good news is that the state has set up a system to help out those whose cars were lifted by the less-efficient municipalities. Locate your vehicle, find out how much the ransom is, and pay it. The towing and storage fees will be outrageous. Since this is state-sanctioned theft, there is not much you can do about the amounts they claim. (There is one option listed below). You will then get your car back in the same condition in which it was parked.... I kid, of course. Your car will be all banged up from the tow truck driver who hurried to snag your car before you came back and then from being smacked into other hostage cars at the lot. And every employee there will swear your car was "like that" when they picked it up. 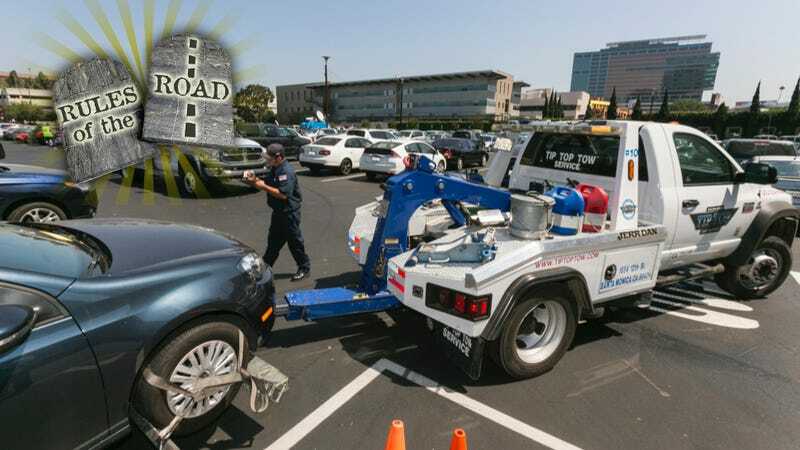 If there is a lienholder on the car before it is towed, they may redeem the car to protect its interests and then you can deal with them.They will probably tack on all kinds of processing fees but at least they will probably be more reasonable to deal with than the impound lot. Probably. Here is where it gets ugly. If you do not redeem your car in time, it will be sold at auction. In keeping with the archaic nature of our laws, notices of the auction will be placed in the local newspaper to notify the townsfolk of the upcoming event. A News-paper is something many of you young folk will not be familiar with. Many years ago, the citizenry got their news from words inked onto huge sheets of paper. There would be many of these sheets, stacked and then folded, and children would deliver them to your home by throwing them in your bushes every morning. Many of your ancestors learned of the American Revolution and the start of the Civil War while reading the "front page" of these news-papers, standing in shrubbery while still in their pajamas. But I digress. Seriously, the auction notices are put in a local newspaper. If you actually got a notice about your vehicle, or found out about it some other way, you learned the exorbitant amount required to recover your car. If you want to, you can challenge this amount or the process itself (like, if your car was not illegally parked but was grabbed fraudulently) by filing a petition with the local court and fighting. In Michigan, to have the petition heard, you will need to post a bond for every penny they say you owe, plus $40. Theoretically, if the court ruled in your favor you would get your money back. But that rarely happens. They do, however, now have your money. NEXT! But hey, it's always cute when someone tries. And just for fun, I should note that if your vehicle was towed as described above, it will get even more expensive than just the towing and storage fees. If the car was deemed "abandoned," you will be fined. If the car was illegally parked, you will be fined. And just because the state sometimes passes crazy laws to see if anyone is paying attention, the act of leaving your car by the side of the road is now also considered "littering," for which you can be fined up to $5,000 "plus costs, state assessments and other statutory penalties." Trust me, those last ones are killers. And these fines, costs, assessments, penalties and so on can be assessed regardless of whether you redeemed your car or let it get auctioned. And, as noted elsewhere, the foregoing is why you are well-advised to make sure any vehicle you sell is properly transferred into the buyer's name as soon as possible. This varies from state to state but in Michigan, it is highly recommended that you go with the buyer to the Secretary of State's office to oversee the transaction. The state even recommends it. If you don't and someone abandons the car before they have titled it in their name, guess who gets hit with the littering charge and the outrageous storage fees? Steve Lehto has been practicing law for 23 years, almost exclusively in consumer protection and Michigan lemon law. He wrote The Lemon Law Bible and Chrysler's Turbine Car: The Rise and Fall of Detroit's Coolest Creation.